Despite many years of observing and commenting on the human condition, I continue to be amazed (though no longer surprised) at the ignorance and arrogance (fellow travelers) we humans often display with regard to our own well-being. And no, I'm not talking about the Tea Party and its hostages in the Republican Party. At least not exclusively them. Rather, I'm talking about the people who, in the name of commerce, science, progress, even good health, look upon nature as something to be improved upon, to be conquered, to be shown, in effect, who's boss. The folks at Monsanto, who feel compelled to genetically modify so much of the food we eat, are a prime example of this attitude. Growing more and hardier crops in smaller spaces means more profits, even though no one can say for certain that the science behind the profits will eventually prove to be safe for humans. Their arrogance bought the ignorance of a feckless Congress, which protected the company from revealing its GMOs on food labels. But, I have another example of humans recklessly meddling with nature in mind here. We're talking about honey bees, which are dying at a rate that cannot be good for the planet or those who live on it. In fact, honey bees have been disappearing at an alarming rate for more than a decade. Some say a million colonies a year. Gone. No trace. It's the kind of things most people don't notice. After all, we"re just talking about bees here, right? But those who grow fruits and vegetables depend on the bees for cross-pollination, the process that allows fertilization and productions of seeds. These food producers have been well aware of the growing bees crisis. Last year, scientists said they believe they finally figured out the culprit -- a group of pesticides known as neonicotinoids. Produced mainly by the chemical giant, Bayer, these pesticides are present in commonly used home gardening products and are regularly sprayed on millions of acres of corn, soy, wheat and cotton seeds in the United States alone. Scientific reports say the insecticides act as a nerve poison, infecting the pollen and nectar of plants, disorienting the bees and making it impossible for them to find their way back to their hives. In addition, scientists believe aggressive land development and the destruction of natural bee habitats has added to the disappearance. Plus, some of those genetically modified organism crops have had toxic insecticides introduced into their genetic structure, in the name of making them hardier. But scientists think the toxins may also be poisoning the bees. Here's where the ignorance and arrogance come in. Do we want to depend on chemical giants like Monsanto and Bayer to guarantee a healthful supply of fruits and vegetables, or would we rather depend on the stewards nature provided -- the honey bees? My money's on the bees, but commercial beekeepers can't compete with the money the chemical companies spend on gaining protection from state and federal government agencies. Still, the beekeepers last month sued the Environmental Protection Agency, asking it to remove its approval of two widely used neonicotinoids. (Germany and France have done so.) Bayer continues to insist they are safe. The EPA's lukewarm response was to send a team to California, where millions of commercial hives are needed yearly, to talk about the problem. Talk is cheap. 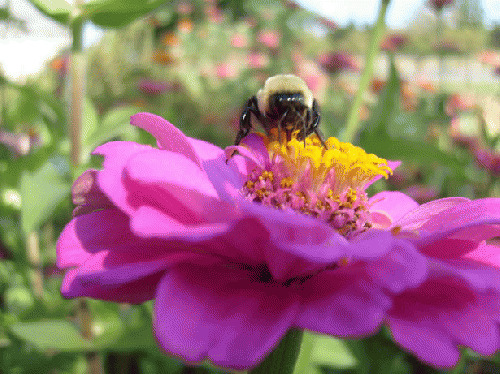 The EPA, which relies on the chemical companies' testing to determine the safety of their own products, needs to launch a full scale review of these pesticides, as well as the toxins spliced into crops, to determine if they are, in fact, killing off millions of bees and jeopardizing the bountiful food supply nature has provided without any help from humans. We would do well to listen to the warnings of the honey bees and the people who know how to work with and nurture them, rather than the profit-driven assurances of giant purveyors of better farming through chemicals. If you care about the food you eat, write the EPA to take meaningful action, via their web site: epa.gov. Or, sign a petition at change.org: click here Help the bees find their way home. Series: "The food we eat, or don't"
View All 8 Articles in "The food we eat, or don't"